We don’t usually review single tracks, but soon as I starting playing ‘The Narrator’, I knew I had to write about it. This mammoth twenty-minute track is seemingly part of a build to the next full-length release from Greenhorn; though, that is pure, disgusting, speculation. It is fitting that the first impression of ‘The Narrator’ is a bleak Lovecraft-esque drawing of a creature from some desolate, swampy dimension. Musically, the track is a similar story of a monster crawling from its brooding abyss to send humanity into a dark oblivion. From the opening beacon of static, the listener is sucked in by a tractor beam powered by enrapturing Iommi-esque guitar work; ‘The Narrator’ immediately entrenched its talons into my skull until its instrumentation was firmly embedded in my brain. There’s something about the way the track foreshadows its own doom at the beginning, before falling into this foggy heath of an interlude; like some Shakespearean prelude to things to come. The thane of Cawdor rides to the sound of marching drums; soothing rhythmics with a 70s tone building impetus and aggression in connotation alone but, estranged they remain powerfully alluring. This opening passage has no discernible words at first though; there is a dialogue in some broken, urban warfare soundtrack of walkie talkies but, the literal meaning of what’s said has been eschewed in favour of a more imposing atmosphere of bloodshed and dread conjured in the connotations of warfare. The original samples apparently come from a record of H.P. Lovecraft and whilst that obviously fits into the whole character of the release; what it really adds is an overwhelming sense of conflict and dread. It’s so surprising when the first act relents and suddenly angelic vocals pour into the mix like a geisha, or a chorus stepping into this unfathomably perilous diegesis like an intervention. Accompanying brutalist, mechanical guitar work and percussion like hot oil spitting bile, the lead vocal sings a somber monologue: “sent into sadness, drifting so slow/the landscape is barren/Just like the creatures so/shrouded in darkness, let them take them down below/remains of the rotten, the stench of skin and bones/ocean escapes me, lost in the deep and low/sent into madness, drifting so slow”. It feels like a disassociated, narration of a fall from grace to despair as told by a character outside themselves. The crescendo of the track is actually the one part that lets it down for me. However, the section it leads into again is this magnificent guitar interlude that skates on the edges of metal and prog in another section fairly reminiscent of the best metal guitarist of all time, Tony Iommi. As the track winds down, its strongest elements resurface and the brooding, restlessness of battle cries and war drums is now replaced by this complementary feeling of charging through the final fight to ride off into the sunset for home. For me, this twenty minute story is one of hardship and struggle and a desire to overcome the bleak challenges we each face as we drift through life. and for the most part it’s told expertly well. 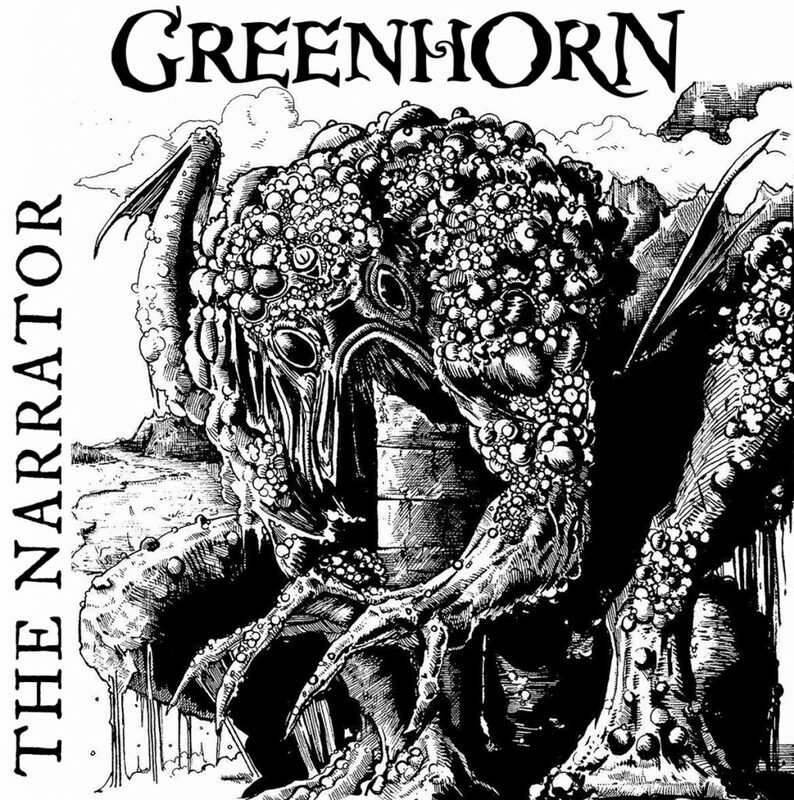 ‘The Narrator’ affirms a great deal of potential in Greenhorn and I believe that with the right facilities and time on their side, this band could be absolutely exceptional. Check out Mark Angel Brandt’s interview with vocalist/bassist Simon Williams here. 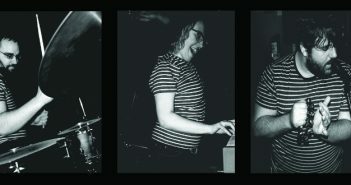 You can also read our review of their last full-length Like Rows of Crooked Teeth here. 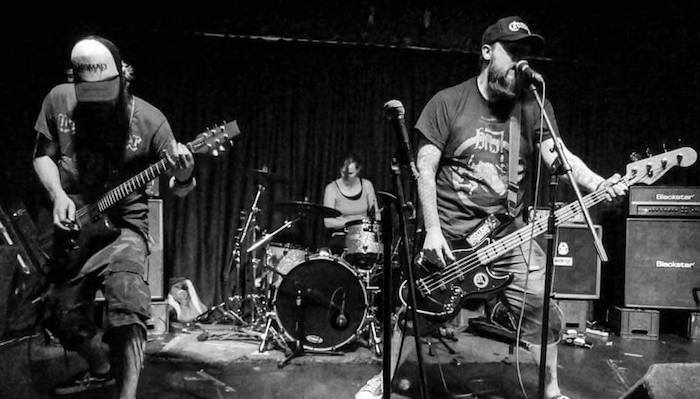 Greenhorn are on Facebook, you can buy their music on Bandcamp and via Black Bow.